The issues brought up by Jan Tomasz Gross in Neighbours. The Destruction of Jewish Community in Jedwabne were covered in the media every single day between autumn 2000 and autumn 2002. The publication gave rise to a national debate over Polish-Jewish relations during the war, ushering in a shift in social awareness regarding the atrocities of the past and their legacy for the future. The book was published in May 2000 in the form of a historical record of the massacre of the entire Jewish community of the town of Jedwabne seventy years ago. While the memory of other such tragedies in other Polish towns has been burrowed away, Jedwabne has raised a monument to the victims, etched with the awkward inscription: "Site of a massacre of the Jewish community. The Gestapo and the Nazi military police burnt 1600 persons alive on 10 July 1941". Jan Tomasz Gross's Neighbours has denied this version of events. He puts forth the assertion that the perpetrators of this mass killing were not Germans, but Poles - those who lived side-by-side with the victims as neighbours up until that fatefull day. It wasn't the armed occupiers in uniform doing the killing, but civilians, town locals. What more, Gross suggested that there was no order issued, these acts were undertaken voluntarily by the inhabitants of Jedwabne. In a town of 2500 people, oppressors and victims find themselves in rather close quarters - attending the same school, frequenting the same shops. Until one day when society divided up into two sides - victims and oppressors. The group itself was to be punished - no one was singled out as a perpetrator of any particular crime, nor were any specific misdeeds or injustices cited - a collective wrath was set upon the Jewish community as a whole. From daybreak they were chased them out of their homes, caught them on the streets, those who tried to hide were dragged back out in the open, those who tried to escape the town were forced to turn back. The oppressors experienced no difficulty in recognising who was of Jewish origins as they'd all lived together for so many years - no questions needed to be asked. They saved no one. Anyone who resisted, fought back during the round-up, or was bullied by a particularly vehement oppressor, was mercilessly beaten. The rallying point was at the town's main square. There was no escape; they were surrounded by perpetrators and onlookers. Following several hours of humiliation and violence, the perpetrators took away a group of forty young, strong men capable of fighting back. Outside the town, in a field near the Jewish cemetery, they killed all of them with primitive tools - a stick, a knife, or an axe. Then, they drove the remaining group to the same spot. There, they chased them into a barn and set it on fire. Nobody was saved from the flames. On July 10, 1941 the Jewish community of Jedwabne was obliterated. Two weeks earlier the town had been captured by the Germans. Previously, Jedwabne had been occupied by the Soviet Russian forces. The German occupiers were represented by a military police station, which consisted of eleven officers. On the 10th of July the Nazi policemen were present in town, but did not actively participate in the pogrom. There were no other Germans in the town on that day. A day earlier, the town had been visited by a few Gestapo agents. They had had a meeting with the mayor and several high-ranking citizens and went on their way. The following day these same citizens initiated the pogrom, urged on, it can be assumed, by the Gestapo agents. A few days earlier in Białystok, the Germans had driven a large number of Jews into a synagogue and set it on fire. On the 7th of July in the nearby town of Radziłów Polish citizens set a barn on fire, filled with several hundred of their Jewish neighbours. A day earlier in that town, the Gestapo agents had also held talks with the pogrom's organizers. Unquestionably, as Gross writes, without the Germans' knowledge, consent and inspiration, the mass killing of Jews in Jedwabne could not have taken place. However, he underlines that civilians were the sole perpetrators of this massacre, and its direct executioners. They were neither forced nor controlled by anyone from outside. Before this book, nobody had narrated such a story - or series of stories, as the book recounts several other incidents that took place in other towns across the country. It was not carried out by informers, blackmailers, or denouncers, pejoratively called "szmalcowniks". In Jedwabne, the crime was committed by a large group of the town's citizens (according to Gross's calculations - half of the town's men), including the Mayor. They did so openly, methodically over the course of the day, before the eyes of anyone who cared to watch. And nobody stopped them. For nearly sixty years such events were not revealed to the public - in Jedwabne the truth was indeed told but few were keen to publicize it further. 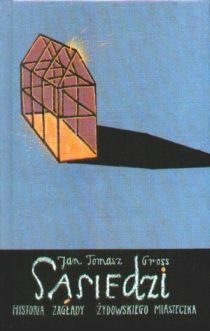 Jan Tomasz Gross derived his knowledge from two main sources. One of them was a testimony given on April 5, 1945 by Szmul Wassersztejn, one of only several Jews from Jedwabne who survived the war, before the Jewish Historical Committee. The other source came from files of two penal proceedings from 1949 and 1953 instituted against participants of the pogrom in Jedwabne. Wassersztejn's testimony was known to a group of experts, and although it was even cited in historical publications, the truth about the crime was not disclosed. Gross himself admitted that a few years had passed before he fully understood the meaning of the testimony. The court files remained unknown, although the proceedings held in Łomża and Białystok were not closed to the public. And yet, they were forgotten. It wasn't until the publication of Neighbours that a breakthrough in historiography was made, which ploughed through social awareness. On August 31, 2000 the Polish Institute of National Remembrance instituted an investigation into the crime committed in Jedwabne. The findings were published two years later. Still, the investigating department of the Institute had issued a preliminary confirmation of the main thesis of Gross's book, namely that the local Poles were the direct perpetrators of the mass killing. The Council for the Protection of Struggle and Martyrdom Sites undertook actions to tidy the site of the massacre, commemorate its victims in accordance with the historical truth, as well as organize a national commemoration of the 60th anniversary of the massacre of Jews from Jedwabne. On July 10, 2001, before international participants, including relatives and compatriots of the murdered, President Aleksander Kwaśniewski apologised "on behalf of those whose conscience has been touched by this crime". Earlier, on May 27, 2001 Catholic bishops, who decided not to participate in the ceremony in Jedwabne, and who perceived the public debate over Neighbours as posing a threat to Polish interests, had celebrated a penance mass at the All Saints' Church in Warsaw for the participation of their compatriots in the massacre of Jews. These events were thoroughly covered by electronic media and press. Gross's book came as a shock. The public was not ready to accept the fact that there were Poles who contributed to the extermination of Jews carried out by the German occupiers. Many participants in the debate took a defensive stand, attacked Gross, his book, and anybody who has attempted to shed light on shadowy issues related to the war, injecting some truth into the historical record. Objective critics of Neighbours reported many passages that required correction. The most important of these concern the number of victims as the number of 1600 cited by Gross is considered an overestimation. At that time there were not even that many Jews living in Jedwabne. On the basis of an opencast exploration of the grave site, the National Institute of Remembrance determined the minimal number of victims at 340, whereas the actual number may be higher by several dozen to one hundred fifty persons. The Institute's historians conducted intensive research, and in autumn 2002 published a two-volume collection of studies and documents entitled Wokół Jedwabnego" / "About Jedwabne (edited by Paweł Machcewicz and Krzysztof Persak); 1500 pages. They found that in the summer of 1941 pogroms of Jews took place in more than twenty towns located in the Łomża and Podlasie region. Anna Bikont published findings of her own investigation in a book My z Jedwabnego" / "We from Jedwabne (Warsaw 2004) presenting new information on pogroms in Jedwabne, Radziłów and (the least known of all) Wąsosz, on July 5, 1941. Neighbours inspired the creation of more than twenty books. A good recapitulation of the press debate was provided by Piotr Forecki in: Od 'Shoah' do 'Strachu'. Disputes over the Polish-Jewish Past and Remembrance in Public Debates (Poznań 2010). © this edition: Fundacja "Pogranicze"